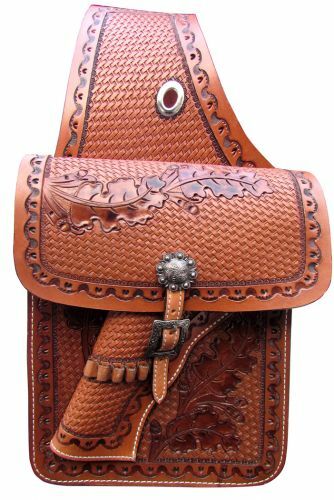 Showman ® Basketweave tooled leather saddle bag with 22 caliber gun holster. This saddle bag features basketweave tooling with a large tooled leaf design. This bag includes a 22 caliber gun holster under front pocket. Bag is accented with brushed nickel conchos and buckles and comes equipped with front D rings. Bag measures 10" x 10" x 3" with a 4" gusset.